panik588, American Bryan, Fat Toney and 8 others like this. Ok, take two. Above is our departure 12-8-16 and the following is 5 days later. But hey, that was 3 weeks ago and we are ready to set out again tomorrow. So briefly, after years of planning, we've broken free of the shackles of work and routine and plan to make our way RTW. Leaving the far south coast of NSW, Australia. Making our way to Darwin, cross over to Timore Leste, South East Asia and somehow find our way to the shores of the Mediterranean in a years time. If we are up to the challenge, then it's off to Africa for a year or so. Then Sth America, cross over to Nth America. Back to Europe, trans Russia, Japan and home. Of course that is the plan today, who knows what will eventuate tomorrow? As the above photos attest to. So a little back ground. We are Graeme and Katrina Perkins, from time to time, we liven things up a bit. We spent all of 84 in Nth America, knocking up 28000 miles on a 81 Shovelhead. In 97, we packed ourselves and the kids ( 4 & 5 ) up, for a planned 4 years sojourn to England/Europe and ended up staying for 6. How long this little adventure lasts is anyones guess at this stage. So climb on board and come along with us. I can only imagine, or at least hope, we have already peaked in the adrenaline stakes. Oh, by the way. 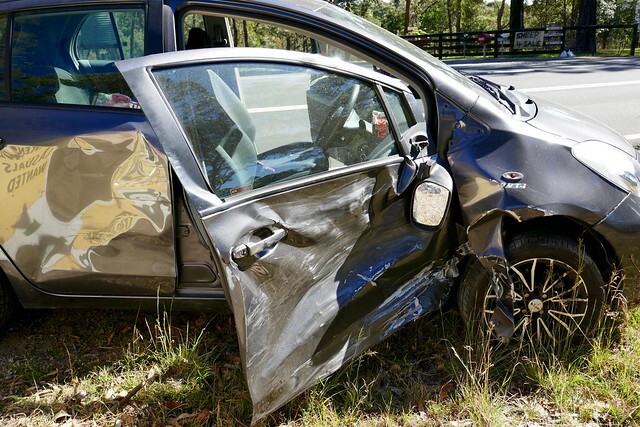 We walked away from the above, with barely a scratch. Bike was a write off though. Our first and hopefully last "off" in over 40 years of riding. Foot dragger, Cybsal, tart and 19 others like this. So a little back ground. We are Graeme and Katrina Perkins, with some 'form on the board". We spent all of 84 in Nth America, knocking up 28000 miles on a 81 Shovelhead. In 97, we packed ourselves and the kids ( 4 & 5 ) up, for a planned 4 years sojourn to England/Europe and ended up staying for 6. 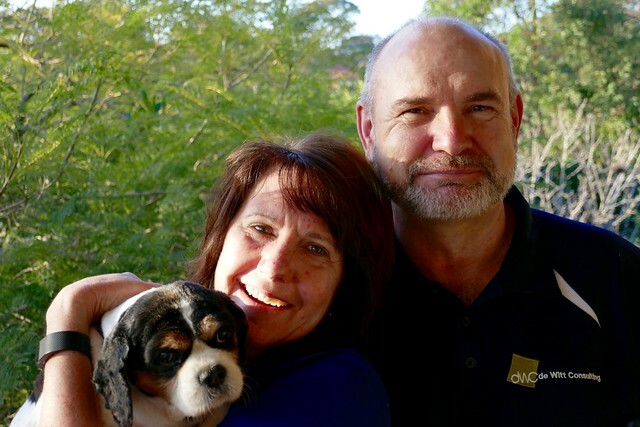 Before we set out today, i want to just say how much we owe our great friends, Wolfy and Lorrae a huge debt of gratitude, for hosting us for these last 3 weeks. 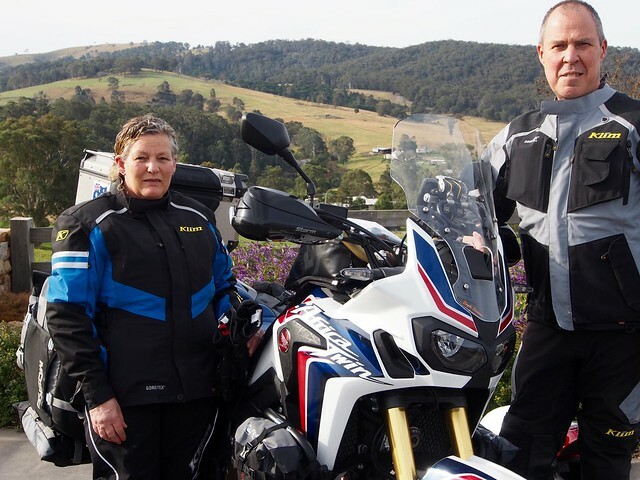 Without their help, getting back on the road with a new bike and all the work that is required to get it ready would have been a nightmare. td63, panik588, Cybsal and 13 others like this. Radio! I guess I have the face for it. I'm going to try and give a subjective assessment as time passes, on Honda's claims of their AT's, world traveling capabilities. Aces 6 and dodgierogie like this. We are a little slow on updates, on account we are trying to put some miles behind us. Two reasons, one, we are attempting to catch up on some lost time and two, we are trying to stay in front of some wet weather systems. The country out here has had a fair bit of rain of late, making our preferred dirt road option a non starter. With potentially more on the way, it seems prudent to keep on the move. 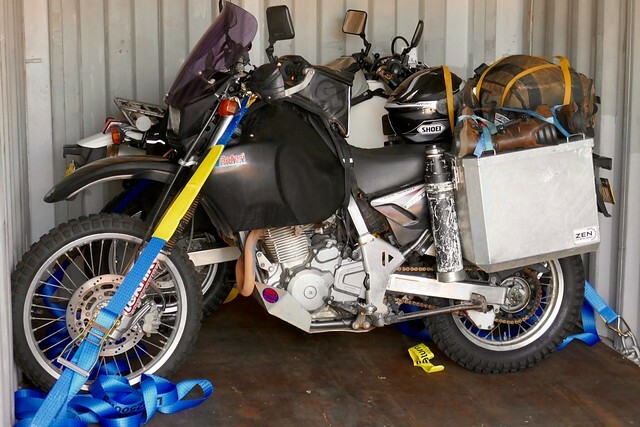 At this stage we have a tentative loading date for the bike, on or about the 28th Sept, arrival into Dili about the 5th. My best guess is, we won't get it back untill at least a couple of days after that. All up maybe 10 days "bikeless", but probably more like 2 weeks. Anyway here's a couple of photos for your amusement. "Hey kids, lets go down to the park and play with the ants, don't forget to bring a sausage"
Max Wedge, juno, SmilinJoe and 2 others like this. 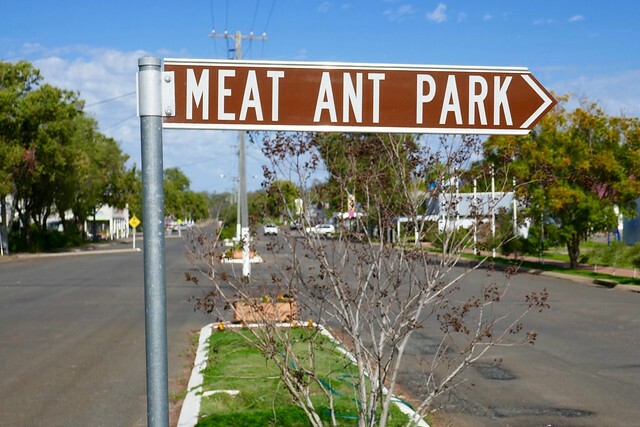 Cultural and history warning, from here in Australia, who would have guessed, weird eh! 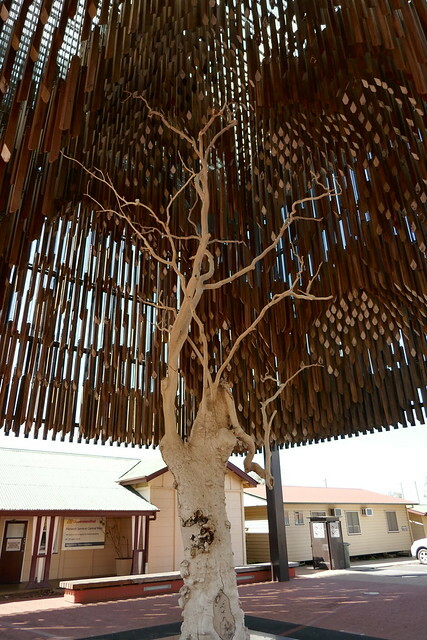 ( apologises expressed to Australia's original inhabitabts ) Anyways heres a dead tree, known as the "Tree of Knowledge". It was under this tree that the shearers back in 1891 sat down and went on strike. For the usual reasons of course, wages and conditions. Many were jailed for their actions. The upshot being that a semblance of democracy was born, along with our first political party. The Labour party. Seems some fool poisoned the tree not so long ago. I hope whom ever they are, they're guilt ridden. Tomorrow, we head up into the Gulf country. 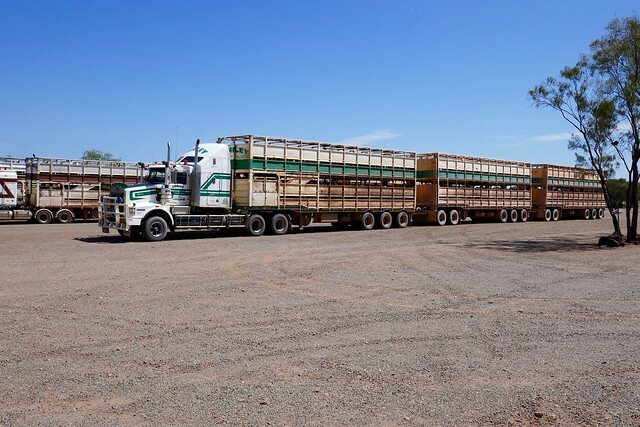 It's getting hot and fuel availability could be an issue. Lets see how this Africa Twin performs, on some dirt. SmilinJoe, Erinaceous and robyn like this. It feels like we have been to Hell and back. 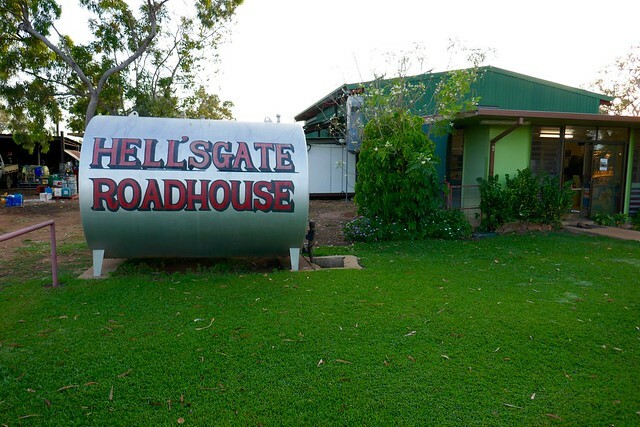 Hells Gate road house that is. 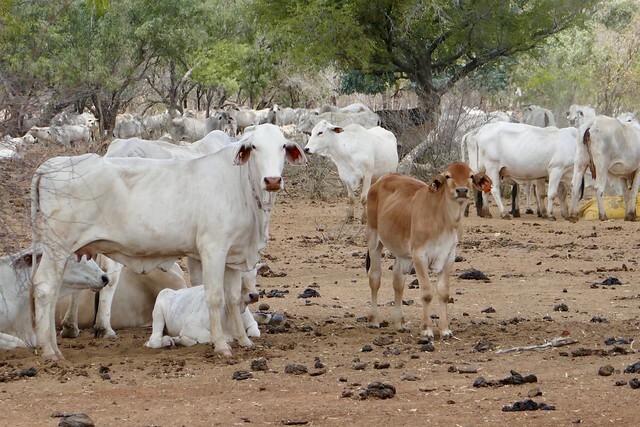 Our plan was to avoid the main east - west traffic across northern Australia, by taking the Savannah Way that cuts just below the Gulf of Carpentaria. Having ridden 550 klms to get to Hells Gate, the last 30 klm's on dirt. We reassessed things. 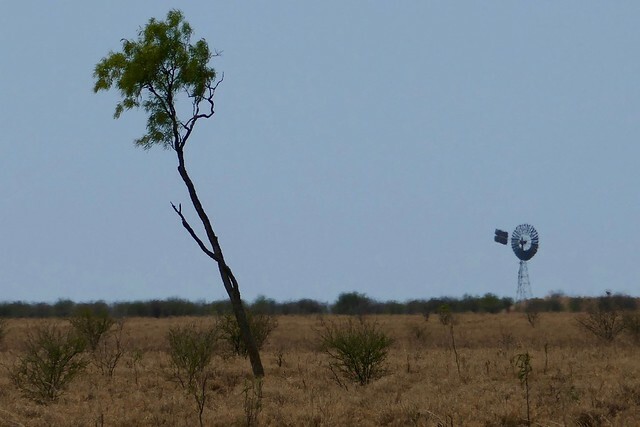 It seems the grader had not long gone through and knocked down all the corrugations. That left an inch or so of marbles on top of the road to ride on. Now 440 odd kg's of bike, rider, pillion and luggage is a handfull when riding on marbles and seeing there were another 320 klms yet to do. It seemed prudent to retreat to where we came from. Oh these behemoths also came into the decision making. Of course they are carting these bovines about. So sharing this sort of road with that lot, all the time looking out for either a patch of marbles or bull dust, for hours on end, didn't seem such a good idea. 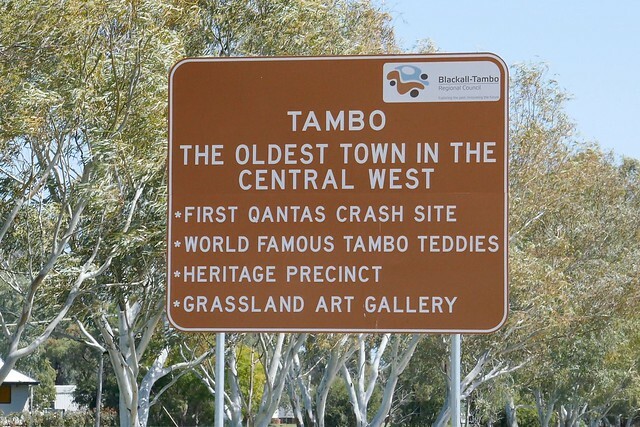 But you do get to see some iconic outback. Along with some amazing wildlife. Like Emus with their chicks and Brolgas. All the time hoping they don't have a death wish and take you out. Of course no piccy's of the wildlife. They're gone before you could ever get the camera out. flying.moto, LadyDraco, SmilinJoe and 4 others like this. We have been putting in some long days in the saddle. The heat is pushing 100 deg F, so it would seem best to head for an area where we can just relax for a few days. This seemed as good a place as any. 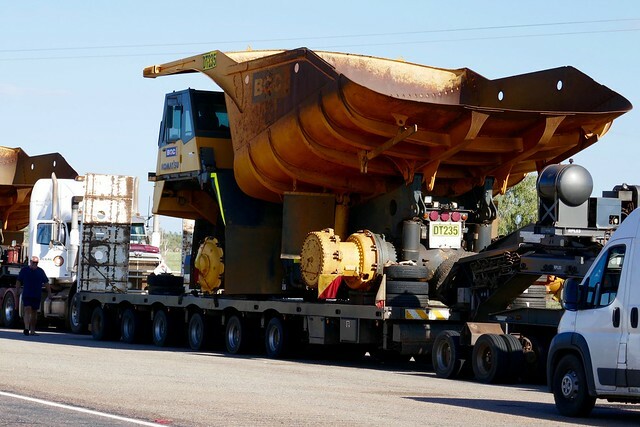 Most everything out here is SUPER sized, like this fleet of "dumpys" going down the road. To be honest, these are average size. We did stop by here for a beer. If your pockets are deep enough you can buy the place for 4 million Ozzy dollars. I might add, I think that will get you the whole town. After pondering that thought for a moment, we decided no, we'll pass up the opportunity. Katrina did consider donating to the bra collection above the bar, but then thought better of it. panik588, flying.moto, Max Wedge and 7 others like this. Wow guys, that trip sounds amazing. I'll be following with interest. Safe travels and keep the shiny side up! My wife and I taught in Doomadgee 23 years ago. Hard to believe that it is bitumen almost all the way to Hells Gate. 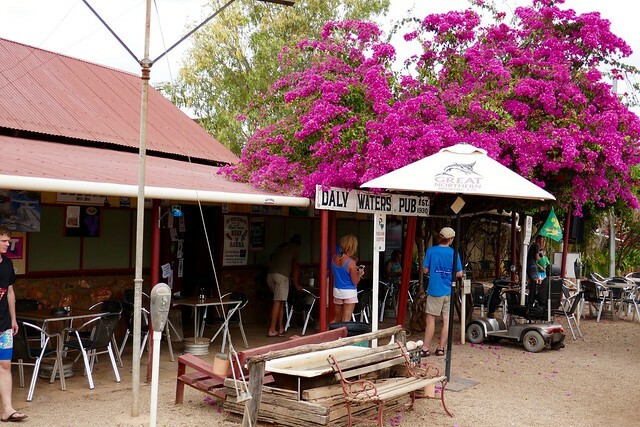 In my day, from 20 km before the Gregory Hotel was the start of dirt for that area and you never saw bitumen until you were in Burketown itself or Doomadgee. This last week, it's felt like we have been in a holding pattern. But none the less, it's been a productive week. We've learnt a huge amount about shipping over to Timor Leste. Met 8 other people whom are also crossing over. This morning we did our final paperwork and dropped the bike off at SDV Logistics. The boat departs on the 3rd and arrives in Dili on the 5th Oct. My guess is, we will be very lucky if we get it by the end of next week. Lets see what eventuates. One thing is for certain, all of a sudden, it just got real! 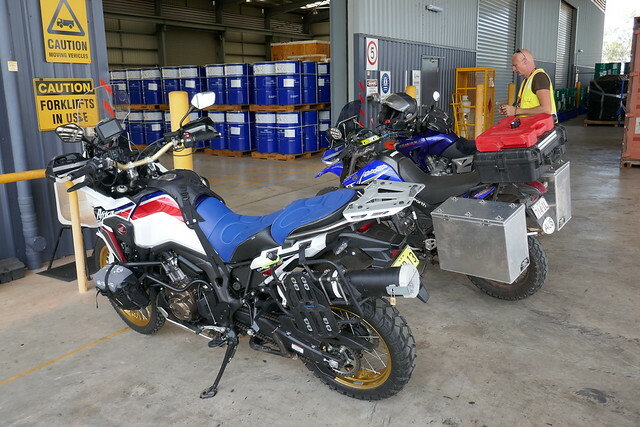 Clint's, Iyron's and our bike's, at SDV Logistics, Darwin. 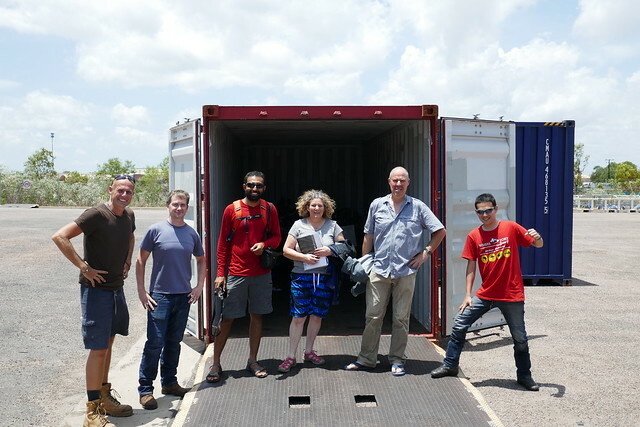 Vee's and Malte's bikes already loaded into the container. A bunch of happy adventurer's, L - R, Clint, Stewart, Iyron, Katrina, Graeme and Mario. panik588, SmilinJoe, MrKiwi and 5 others like this. Wow its all happening now! Love watching your progress and looking forward to the next installment. Have fun!! Wow guys, the that trip sounds amazing. I'll be following with interest. Safe travels and keep the shiny side up! My wife and I taught in Doomadgee 23 years ago. Hard to believe that it is bitumen almost all the way to Hells Gate. 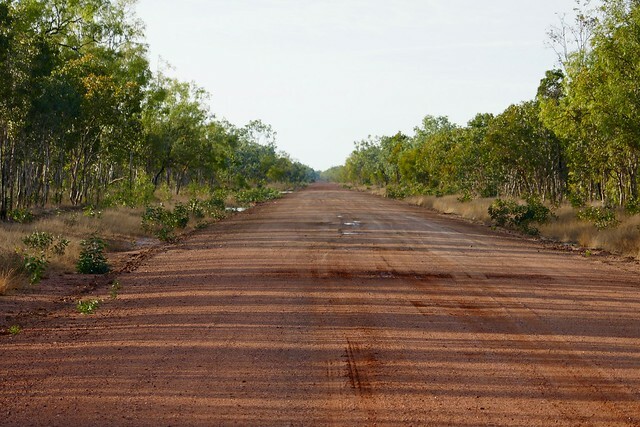 In my day, from 20 km before the Gregory Hotel was the start of dirt for that area and you never saw bitumen until you were in Burketown itself or Doomadgee. 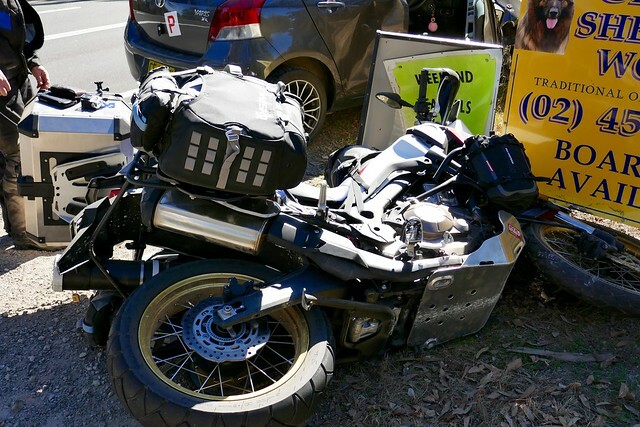 Yeah D_S, this bike loaded to the gunnels, on road tyres, on that road was inviting disaster. Solo, with good knobbies, whole different story. But that ride is for another time. Thanks for the encouragement Robyn. This free time in Darwin feels like building a reserve of energy for times ahead. awesome stuff,may i ask what is the tyres you have on the AT?? Heidenau K60 Scout, Dodgierogie. I decided to stick with the original tyres until Darwin. No matter what, I wanted a new set before crossing over and I couldn't justify fitting new tyres prior to leaving home. My expectation is that I will be changing again in Thailand. But hey, who knows. Congrats!!! Keep it coming... How is the suspension two up?... You have front and rear spring preload at max settings?.. Tyre pressure?.. Thank you! !